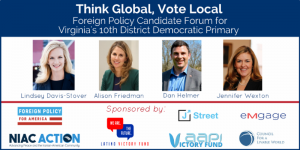 MCLEAN, Va. (March 4, 2018) — Leading candidates in the VA-10 Democratic Primary-Lindsey Davis-Stover, Alison Friedman, Dan Helmer and Jennifer Wexton-discussed issues affecting U.S. national security, prosperity and values on Sunday during a forum organized by the AAPI Victory Fund, Council for a Livable World, Emgage, Foreign Policy for America, J Street, Latino Victory and NIAC Action. Collectively, the organizations believe it is time for a new conversation about America’s engagement in the world, and that our country needs leaders who will stand for strong, principled American foreign policy. “Muslim voters will play an important role in this election, and it is important for our community to get to know the candidates and understand where they stand on the issues that affect us most,” said Wa’el Alzayat, CEO of Emgage. VA-10 has been held by a Republican since 1980, and it was named a battleground district in 2016. A diverse and growing community, VA-10 is 7 percent African American, 14 percent Asian American and 14 percent Hispanic. In 2016, Democratic Presidential candidate Hilary Clinton (D) won this district by 10 points, and Governor Ralph Northam (D) won by 13 points in 2017.